Tennis Center (& Track) now open for 2019! Tennis Center membership online registration is available, look for the membership button on lower left. Summer clinic schedule forthcoming. NO FURTHER LESSON REQUESTS TAKEN FOR WEEKENDS. Lessons on Weekday (early) Afternoons are not yet available. If you have questions, contact tenniscenter@stalbansschool.org. 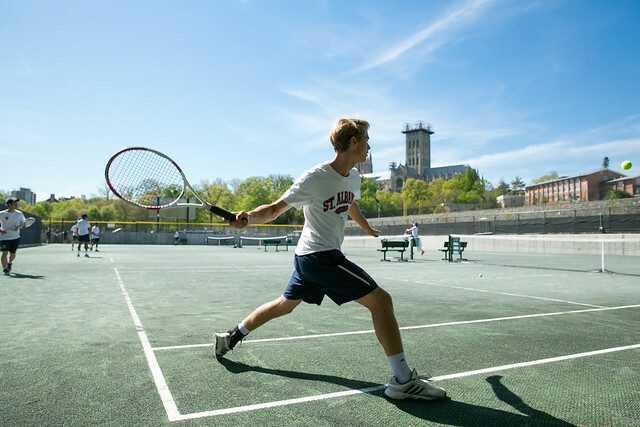 The St. Albans Tennis Center is an outdoor facility with 7 clay courts situated on the magnificent grounds of Washington National Cathedral. The Tennis Center features men's and women's lockerrooms, each with dozens of half lockers and 2 showers; there is also spectator seating on the roof. Members of the Tennis Center enjoy such benefits as various types of reasonably priced memberships with no additional court fees; play as early as 6:00 a.m. daily; no reservations; $20 guest fee; and an array of activities including clinics, juniors’ summer camps, tournaments, and social events. All St. Albans tennis members, from 4 year olds to our more distinguished players, will find our staff of instructors, maintenance workers, and directors to be friendly, hard-working, and dedicated. They consistently provide the very best tennis atmosphere from top to bottom, as befitting an institution representative of St. Albans School. We hope to welcome you to the St. Albans tennis community. We are sure it will be a fun and rewarding experience for all! Single membership is for one person only. Family membership includes spouse and/or children under the age of 21. The primary member in a family must meet the stated age requirements for membership. STA parent membership includes spouse and/or children under the age of 21. Student(s) must be enrolled at St. Albans School at the start of the season. Year(s) of attendance/graduation must be verified by our Alumni Office. Family membership includes spouse and/or children under the age of 21. *Summer Only members are only eligible for Tennis Center Member pricing during the summer and are NOT eligible for the Summer Programs discount. To qualify, you must be at least 70 years old and have been a Tennis Center member for 20 consecutive years. Contact the club via email or at 202-537-5765 for registration options. Billing: Members of the Tennis Center will be billed for tennis balls, stringing, lessons, clinics, tournament fees, etc., every month during the season. For junior clinics, please go to the next section. The Tennis Center’s various programs focus on stroke production, mechanics, footwork, mental toughness, fitness, etc. Our programs are exciting, innovative, and geared towards different skill levels to maximize learning and fun! To ensure that each performance level receives the most appropriate and effective coaching, students in group lessons or clinics will be subdivided based on ability and previous tennis experience. Descriptions for the clinics are listed after the schedule; please read them. For junior clinics, please go to the next section. For the following classes: Signing up in advance via email or calling is strongly encouraged and preferred. There is a 2 person minimum and 6 person maximum; please cancel your attendance to a class at least 24 hours in advance. You must receive confirmation from the office that a space can be secured for you. Participants must sign up individually. Under-enrolled dates will be cancelled. It may be possible to drop-in for $35, however you must receive confirmation from office that session is running or not full, therefore inquiring 24 hrs in advance is strongly recommended. *The Doubles Strategy class is $35 per person for members & non-members alike. Sign up through office. Please visit our online store https://squareup.com/store/st-albans-pro-shop to register. A fun group activity featuring drills to give players of all abilities an ultimate high energy workout. Includes warm-up, cardio workout, and cool down phases. This class is for adults with no tennis experience or with fundamental knowledge, however have not played enough to develop skills. A class with drills focusing on singles and doubles for 30 min of class and 30 min strategy and play. This class should be good for former high school players that have kept up with their tennis skills and tennis knowledge. This class will focus on strategy and competitive tennis situations and is designed for players of high level that have competed in tennis tournaments and competitions in the past. Please report to the St. Albans Tennis Center at 34th and Garfield Streets, NW. All participants should bring a tennis racket, tennis shoes (running shoes are not allowed), proper tennis clothing, and water. Parking on the Cathedral Close is strongly encouraged. No parking permit is required on weekends. Please avoid parking on Garfield Street. The St. Albans Tennis Center offers private and group lessons starting as young as 4 years old. Tennis lessons are available for both members and non-members; however, during sign-up, priority is given to members. Court #4 is reserved for private or group lessons. Note: Lessons must be scheduled or cancelled through the Tennis Center office, at least 24 hours in advance. Clinics are available for both juniors and adults during the spring, summer, and fall. For additional information regarding other clinic options, including interest in creating your own group or clinic, please contact the office. *Adult clinics are noted in the preceding section. Our weekend youth program caters to ages 4–12; where participants are separated by age and then ability. Clinics run for 60 minutes, and we will offer 3 sessions throughout the season: Spring, Summer, and Fall. To find out specific details about each age group, click here. Tennis shoes and tennis clothing (of any color) must be worn. Please visit our online store https://squareup.com/store/st-albans-pro-shop to register. Capacities: Except where stated, there is no defined limit for each group, although the instructors/management has the right to close or restrict registration once participant numbers reach a comfortable level. You may waitlist for a class by contacting the office (tenniscenter@stalbansschool.org or 202-537-5765), however, there is no guarantee space can be made available. We try to keep our coach/student ratio 5:1. The St. Albans Tennis Center operates from March to December. Maximum hours of possible Tennis Center operation: 6:00 a.m.–8:00 p.m.
Monday-Friday: 7:00 a.m. - 2:00 p.m. & 6:00-7:00 or 7:30 p.m.
Saturday - Sunday: 7:00 a.m. - 7:00 or 7:30 p.m.
Monday - Friday: 6:30-9:30 a.m., 12:00-1:30 p.m., 4:00-8:00 p.m.
Saturday - Sunday: 7:00 a.m. - 7:00 p.m.
During the school year (late August–November and February–May), all courts will be reserved for St. Albans and National Cathedral School tennis teams, Monday–Friday from 2:00–6:00 p.m. Please note that interscholastic matches may go beyond 6:00 p.m.
Members will be informed of any other changes to these hours. Note: The Tennis Center may close for repairs or emergencies or may need to limit the hours of use due to special events. Any such changes will be communicated to the membership as soon as possible. Click current month's events, for a calendar view of activities at the center. Ms. McDowell began at St. Albans in 2006 as an tennis office attendant and has risen to not only her current status with the St. Albans Tennis Center, but as Asst. Director of Summer Programs. A native Washingtonian, Angela graduated from H.D. Woodson SHS before obtaining her B.A. for the University of North Carolina at Chapel Hill. A viewer and participant in tennis since her youth, she can be found participating in many facets of the business including management, coaching, and hitting the court with members on ocassion. Angela is our head stringer and a member of the United States Racquet Stringers Association. Entering his 11th season at St. Albans Tennis Center, Mehdi was the 1991 Moroccan Junior Champion and represented Morocco in multiple international tournaments and championships. Mehdi also competed in ITF tournaments as well as ATP Futures and Challengers. While gaining his Bachelor’s in Business Administration at Radford University, Mehdi played Division I college tennis and received multiple awards while representing The Highlanders from 1991 to 1995. Mehdi also holds a MBA from The University of Oklahoma, which he currently uses in the banking industry. He resides in Northern Virginia. H’cone is a certified USPTA tennis professional. He joined the St. Albans tennis staff last September. For the past 17 years, H’cone has taught private, semi- private, and group lessons. Prior to joining St Albans, H’cone was the director of junior tennis at Woodmont Country Club. He has worked with children and adults, beginners to world class players, ranging from ages 3-90. H’cone has coached teams, and conducted a variety of clinics including cardio tennis, singles, doubles, and introduction to tennis clinics. H’cone graduated from Lafayette College where he Played #1 singles and doubles and holds the record as the winningest player in singles history. After college, H’cone played Davis Cup for the Bahamas and competed on the futures circuit. He has been stringing tennis rackets for over 20 years. H’cone enjoys working with players of all levels and would love to get you on court! Juan Martin Cabal serves as head coach for St. Albans Junior Varsity and Form I soccer. He grew up playing soccer and tennis, and being active has always been an integral part of his life. He is currently working towards upping his USPTA coaching credentials, and will be assisting our tennis program with a passion for empowering young athletes. When he is not coaching tennis or soccer, Juan Martin is either working at St. Albans as a Lower School substitute teacher or you’ll find him playing tennis, running, biking, or in the gym. He also works as a broker, trading with specialty Colombian tea, coffee and panela-sugar. His second language is German as he graduated from the IB German School in his hometown Cali, Colombia and studied Business Administration at the Philipps-University in Marburg, Germany. Juan Martin is a proud cousin of ATP player Juan Sebastian Cabal, who is currently ranked in the Top 10. Dana is a native Washingtonian and began working for the Tennis Center in 2017. She enjoys working here, especially seeing the children play tennis and improve over time. Dana is honored to continue being apart of our staff. Naomi is a native of Washington, DC and began working for the Tennis Center (& STA rentals) this year. Naomi had her first experience with tennis her senior year at Paul Laurence Dunbar Senior High School, where she played for their tennis team. When not working at the St. Albans, Naomi is an Administrative Assistant for Gallagher Fiduciary Advisors, LLC. Since 2009, Eduardo has been an instrumental part of our staff, helping to ensure that our courts and facilities are well maintained. A native of El Salvador, Eduardo has been in the U.S. for almost twenty years and recently gained his full citizenship. When not at the Tennis Center, he works in the Banquet division of the renowed Hay Adams hotel. He is a big Real Madrid football fan. Carlos is entering his 3rd season as part of our court maintenance staff. He has been a District resident for about 10 years, coming to the States from El Salvador. He is a proud father, helps run his family’s Mexican restaurant in Southeast and enjoys soccer and basketball. A native of El Salvador, Marvin has been in the United States since 2010. When not at the Tennis Center, he works in the Banquet division of the renowed Hay Adams hotel. The St. Albans Tennis Center will open at 6:00 am daily, unless otherwise noted. Since there are no lights, the Tennis Center will close shortly after sunset or no later than 8:00 p.m. Operating hours will be posted at the Tennis Center throughout the season. The Tennis Center will also be available to yearly membership holders during the winter, weather permitting, by appointment only; 24-hour notice is required. The St. Albans Tennis Center will be closed on Thanksgiving Day. The St. Albans Tennis Center entrance is on Garfield St near 34th Place only. Please see the parking link below for detailed directions. We encourage all members to park on Pilgrim Road on the St. Albans School campus. Garfield Street is reserved for neighborhood residents. Appropriate tennis attire, of any color, and non-marking tennis shoes must be worn when using the tennis facilities. This includes shirts, skirts, shorts, dresses, and warmups that are designed for tennis. Examples of unacceptable attire include cutoff jeans or pants; biking or jogging shorts; surfing shorts; bathing suits; leotards or other aerobic attire; exercise tights; t-shirts with printed messages unrelated to tennis; exposed underwear or sports bras. Shirts and shoes must be worn at all times. The dress code applies to members and guests of all ages. All St. Albans Tennis Center members must follow proper tennis etiquette. All members must treat each other with respect and courtesy. We ask that noise be kept at a minimum and that all members refrain from using profanity. Equipment and racket abuse is forbidden. We ask that all members keep sportsmanship in mind during play. Please do not interrupt other matches or retrieve tennis balls from neighboring courts during play. Wait until the point is over before stepping foot on other courts. Children under the age of 12 must be accompanied by either an adult or a camp counselor. If court maintenance is necessary, players are asked to cooperate with staff requests, including possibly moving to a different court or stopping play. Notices will be posted whenever possible. Smoking on the St. Albans School premises is strictly prohibited. Each member is asked to help keep the Tennis Center clean by picking up and discarding trash. No events should be planned on the St. Albans courts without the director’s approval; 8 weeks advance notice is required. Only coaches staffed by St. Albans Tennis Center are permitted to give instruction on its courts. The St. Albans Tennis Center is not responsible for lost, stolen, or misplaced articles anywhere on the club premises. Damaging property violates the St. Albans Tennis Center contract, and those who damage club property are responsible for the cost of repairs. Members who willfully damage any property or violate club rules may be subjected to disciplinary action including suspension. Members who display unacceptable behavior will be asked to leave immediately. Members who witness others violating club rules or misconduct of any kind are responsible to report it to Tennis Center management; please avoid confronting the member(s) and/or guest(s) in question. In the case of injury, membership may be carried over into the follow season free of charge. A defibrillator is available inside the pavilion and is only accessible when an office attendant is present. Courts are first come, first serve. No reservations or additional court fees are necessary. Members must sign in when entering the club to play tennis. Please print your name, guests’ names (if applicable), court selection, and the time. Courts are assigned only when at least two players are present. Court time starts when players sign in. Each member is only allowed to sign in once during peak time (8:00 a.m.–1:00 pm); however, members are permitted to sign in again in the afternoon (1:00 p.m. –closing). Failure to sign in at the front desk may result in the loss of courts; members must sign in as confirmation of the use of courts. The club allows 60 minutes for singles and 90 minutes for doubles. If courts are available past this time frame and no other members are waiting, members are permitted to continue playing. If a member has completed an hour of singles play and would then like to play doubles with another member who has not yet played, doubles playing time is reduced from 90 minutes to 60 minutes. This is done to ensure that as many different members as possible get a chance to play during the “high demand” period. Players who have completed play are encouraged to sweep the court before leaving. Arriving players will be encouraged to clean the lines. Court brooms and line sweepers are provided on court. Court #4 is reserved for private or group lessons at all times. There will be notices posted near the sign-in sheet to inform players of its availability and also of any other courts used for instruction or events. The ball machine is available at an hourly rate of $25, half hour at $15; and can only be rented between 8:00 a.m. and 1:00 p.m. on weekdays. Dogs or pets of any kind are not permitted on the courts or within the confines of the St. Albans Tennis Center. Bicycles, scooters, skateboards, and all other personal vehicles must remain outside the court’s boundaries. No food of any kind is allowed on the courts unless authorized by management. Only management can permit play on courts after adverse weather conditions have passed. Adverse weather conditions include rain, thunder, lightning, high winds, extreme heat, or any other weather-related occurrence. A Tennis Center member must be physically present while a guest is using the center. Guests and accompanying members must register at the front desk when first entering the Tennis Center. Members are required to pay a guest fee of $20 per person for all adults and children who are not members of the club and who will be using the tennis courts. Only members can pay the guest fee; attendants will not accept fees from guests. Guests may not request a court, nor can they be on the waiting list. Guests must comply with all St. Albans Tennis Center rules (shown above). Members are responsible for their guests’ attire; juniors are subject to the same rules. Each individual guest is only allowed to be invited to the Tennis Center a total of 4 times during the season (March – December), regardless of whether they are playing with different members. If a guest wishes to continue play beyond the visit limit, we encourage them to apply for membership. It is members’ responsibility to know whether their guest has been invited to play at the Tennis Center in the past. In the event of inclement weather, guest fees will be refunded. Court #4 will be reserved as the teaching court and is closed to member play unless otherwise noted. If the court is available at the time of your arrival, you are welcome to use it as long as you cede it immediately to any instruction scheduled to take place. During weekdays, instruction will be available from 7:00 a.m. to 7:00 p.m. Private instruction will be available from 7:00 a.m. to 7:00 p.m.
Courts #4–6 will be reserved from 11:00 a.m. to 3:00 p.m. on Saturdays and Sundays for youth clinics. If the instructors do not need one or two of these courts for a certain period of time, they may make them available to members; however, members must relinquish the courts when instruction requires their usage. The St. Albans Tennis Center is the home of both the St. Albans Bulldogs (spring) and the National Cathedral School Eagles (fall). Spring School Tennis takes place February through late May; Fall School Tennis takes place late August through early November. During those periods, all 7 courts will be reserved for school use from 2:00 p.m. to 6:00 p.m.; members should not plan to play on the courts during this time and should vacate the courts just prior to 2:00 p.m.
At times, matches may go beyond 6:00 p.m.; any members (and guests) who arrive at 6:00 p.m. and find that a match is still being played must wait until its completion. The Tennis Center prohibits play on the courts while school competition is underway. St. Albans Weekday Tennis Camp runs from early June to mid-August and will occupy all courts from 9:30 a.m. to 12:00 p.m. and 1:30 to 4:00 p.m.
Members may only use the courts from 6:00 a.m. to 9:30 a.m., 12:00 p.m. to 1:30 p.m., and 4:00 p.m. until closing. Weekday tennis instruction will be limited during the camp season. We ask that the Tennis Center members park on Pilgrim Road (between football and baseball fields). Pilgrim Road is one way, with an entrance on Massachusetts Ave and access off Wisconsin Ave (turn onto South Road, make right on Church House Lane, make left on Lych Gate Road, make left on Pilgrim). Please do not enter the one-way street from Garfield Street! Parking passes are given to members to use from 7:30 a.m. – 3:30 p.m. Monday through Friday. These hang tags are necessary during this time period; however, members are free to park along Pilgrim Road without a tag outside of these hours. In order to cooperate with our neighbors over their concerns, we ask that you please refrain from parking on Garfield or neighboring streets. If parking spaces are not available on Pilgrim Road, please park in the Cathedral garage via Wisconsin Ave entrance. Who can join St. Albans Tennis Center? Anyone! To apply for membership, you only need the desire to play. Affiliation with the Cathedral or its institutions (i.e. St. Albans School) is not necessary. Tennis shoes and appropriate apparel is required. There are no color restrictions. When is the St. Albans Tennis Center open? The St. Albans Tennis Center is open daily, March 1 - December 1. Current operating hours are weekdays from 7:00am-2:00pm and 6:00-7:30pm; weekend hours are 7:00am-7:30pm. We have 7 ClayTech courts on two levels: Lower Level - 3, Upper Level - 4. What kind of surface are your courts? Our courts are ClayTech (Har-Tru). They are a hybrid of a clay and a hard court. They provide many of the same health benefits as traditional clay, through there are some differences. Can I reserve a court? Courts are first come, first serve. Members cannot make reservations. Are there a lot of steps to the membership process? Nope, not many! Register online or contact us for a registration form, complete it and submit with payment. No interviews or recommendations needed. My child attends STA/NCS/Beauvoir, is play at St. Albans Tennis Center automatic? No, however you are eligible for a special rate. What if my child was a former student of STA/NCS/Beauvoir ? Only alumni of St. Albans can join the Tennis Center at special pricing. Parents of alumni must select the appropriate, non-alumni, membership option. I'm not a member, nor do I know any, can I pay a fee for a court? How do you book lessons? Is there an online reservation site? Simply contact us via email, phone, or in-person and we’ll jot down the particulars and see if we can find a spot for you! Clinic registrations can be done online. Do I have to be a member to take lessons or join a clinic? Absolutely not! We welcome all. Do you offer lesson packages? lower rates on lessons and clinics in relation to the general public. Who are your pros/coaches? Can I request a specific one? Please see the Tennis Center Staff section for more information. You can definitely inquire about the availability of a particular coach, but there’s no guarantee. My son/daughter is in one of your weekend clinics and I’d love to play or have a lesson at the same time, is that possible? I just found out about your facility, but part of the season/clinic session is gone, what do I do? Please email us at tenniscenter@stalbansschool.org or call us at 202-537-5765 to find out what your options to join are. If you're interested in a clinic that has already started, it may be possible to join depending on how far along the session is and if there's space. Do you have proshop or offer stringing services? Yes, we have a small proshop in our office, which is available to anyone, even if you don't utilize our facility to play tennis. Patrons can visit during the Center's operating hours. Proshop items available are: Wilson balls, snack bars, water, coconut water, gatorade (incl. G2), overgrips, wristbands, racquet bags, STA-branded apparel, hats/visors, other racquet accessories. We also carry some youth racquets, though certain models are display only and can be ordered on your behalf. We do not sell shoes or currently have adult racquets in stock. Stringing services are available, a stringer in around Monday-Saturday, however they hold other positions with the Tennis Center and may not be in office when you arrive. A string job can typically be done in 2 days; prices vary based on string type or stringing style (i.e. single string, hybrid). Restringing is completed using the Wilson Bariado. Do you have demo racquets? We have a few loaner racquets in various, but not all sizes. We do not currently have a demo program, but are considering for the future. Do you have a ball machine? Yes we do. It can be rented for 30mins or 1hr; member and non-member rates available. General availbility is weekdays from 8:00am-1:00pm (at least 24hrs advance notice is required). Not available in summer due to camp. Do you lights? Are you going to get lights? No and no. None of the St. Albans athletic facilities have lights; all activities must be completed by sundown. Do you have a bubble? No, our facility is strictly outdoors.